« Olympus Announces the "PL Late"
Canon today announced the EOS M5, the latest in their line of mirrorless cameras, and the most DSLR-like yet. While you can see the basics of the EOS M3 body in the new M5, the addition of a mid-camera hump for the built-in EVF and pop-up flash makes Canon’s mirrorless entry look like a very scaled down DSLR. Inside, there’s also some DSLR-like bits, including Canon’s latest 24mp dual pixel APS-C sensor. So immediately the question for potential new Canon shooters is: EOS M5 or EOS Rebel T6s. The question may not be so simply answered. The T6s is US$849 body only, the M5 is US$979. The T6s is 565g, the M5 427g. Both cameras can use sensor phase detect to help the contrast detect system find focus faster (in Live View on the T6s), but the M5 lacks a full-on phase detect system like the T6s’s, which is better for following fast- or erratically-moving objects. Obviously the DSLR has a bit more in the way of features and direct control than the mirrorless camera, partly due to just body size (e.g. fully articulating LCD instead of tilting LCD), but surprisingly not as many differences as you might expect. That tilting LCD you see in the image above is a pet peeve of mine made real. My peeve: engineers that are given a marketing requirement document item (swivel for selfies) and then take an easy way out that is actually not completely useful: you can’t use this tilt on a tripod, for instance; it only really works at arms length by the shooter, which is a limiting factor, especially considering the lenses Canon is pushing. Fortunately, the rest of the camera doesn’t seem to have the same design limitations. We’ve got four direct control wheels and a Mode dial, a very useful touchscreen implementation (e.g. allows moving focus sensor while eye at viewfinder), and no real deliberate crippling of performance or features that we’ve seen in many past Canikon mirrorless entries. This is a real, cut-down EOS in its own right, only mirrorless. And yes, there’s the optional EF mount adapter if you want to use Canon DSLR lenses. If there are disappointments they come in the lack of much in the way of programmable function buttons (one), no 4K video (and low Mbps bit rate in 1080P), the 1/200 flash sync (especially given the ability to use Speedlites), and the small battery (295 shots CIPA). All of which most still shooters can live with, and all are reasonable compromises IMHO. One curiosity is that Canon only made the following claim in their press release: “fastest autofocus speed of EOS M-Series…” Uh, that wasn’t difficult to do, was it? This illustrates one of Canon’s (and Nikon’s) dilemmas: with the EOS M5 having basically the same sensor and Live View autofocus as the 80D, do you ‘diss your own DSLRs while making claims for your mirrorless camera? Canon’s marketing still hasn’t managed to fully explain GX versus EOS M versus Rebel versus the big full frame cameras. They need to. Overall, the M5 body looks like a strong competitor and will give Sony some run for the money in the crop sensor mirrorless market, especially if the sensor performs as expected. But, Canon, like Nikon (buzz, buzz) still doesn’t seem to understand that some of their vulnerability in the mirrorless marketplace comes in the way of lenses. With the EOS M5 Canon announced a new 18-150mm f/3.5-6.3 IS STM, a very Nikon DX-like move. Yeah, everyone that’s going to buy a mirrorless camera wants only a superzoom. As I’ve illustrated with a number of articles on dslrbodies.com, the decline in DSLR sales is being partly fueled by long-term SLR/DSLR enthusiasts simply deciding to downsize. 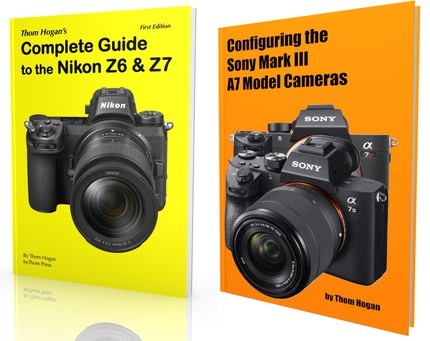 They then look at what they can get lens-wise in the various smaller mirrorless cameras, and they choose m4/3 or Fujifilm X, maybe even Sony E (partly because of the open mount attracting third party makers such as Zeiss). So, Canon, if you’re listening: you need a full line of EOS M lenses now. Yes, a 16mm prime won’t sell as many copies as that new 18-150mm superzoom, but it will protect your market share from eroding to the Seven Dwarves. But now with Canon playing seriously in the mirrorless market, Nikon’s dormant Nikon 1 series looks pretty seriously dead in the water. If Nikon wants to play, they need something new, and with a bigger sensor.